Could rising land slow down Antarctic ice melt? 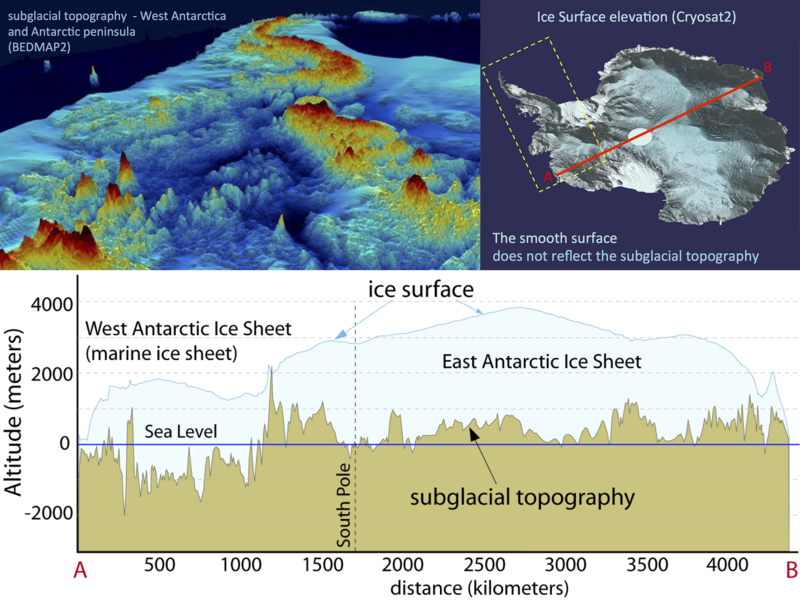 The West Antarctic ice sheet is sitting under water. This is key to understanding the evolution of the ice sheet and how the rising sea floor might even help to slow down ice melt in this part of Antarctica. Our recent study published in Science showed that as the glaciers of West Antarctica retreat, the land beneath is rising much faster than anyone thought. Up to five times faster, meaning that in 100 years the land will be up to 10 meters higher than it is today. Our findings were actually about the structure of the Earth beneath a small portion of Antarctica, which you can read more about here. But media headlines (here, here, here, and here) were quick to focus on the startling and thus far, not well known, implications of the results: Could this process slow down West Antarctic ice melt and even stabilize the ice sheet? The theory is that the rising land (bedrock) could reduce or even prevent ice retreat in the most sensitive glaciers of West Antarctica. But, while we know that it ‘could’ happen, we do not know how effective it would be in this specific region. Here, we can at least examine how this process works and explain some of the factors involved. Read More: How fast can Antarctica rise when the ice melts? The Antarctic continent is the least explored continent on the planet: Inaccessible and inhospitable. It is mostly covered by a thick layer of ice reaching a thickness of four kilometres, which makes it almost impossible to directly observe the bedrock beneath. That said, West Antarctic geology is very interesting, ranging from "relatively recent" volcanism to a rift system. This makes the subglacial landscape extremely complex, with high, steep peaks, and deep troughs and valleys (see the image below). Most of the West Antarctic Ice Sheet is immersed in the ocean and sitting on the sea floor (technically we say that it is grounded below sea level). The huge weight of the ice has shaped and ‘bent’ the surface of the Earth beneath, so now the ice rests on a bowl-shaped seafloor that reaches 2,500 meters below sea level. Here, the ice sheet is exposed to warm ocean currents. This is why we call it a "marine ice sheet". Since the 1960s, scientists have recognized that the peculiar subglacial landscape makes the ice here susceptible to the action of a warming ocean, which causes the ice to become unstable and could eventually lead to its collapse within centuries to millennia. Some glaciologists think that collapse is already underway (also here). This would be bad news, because if all the ice of the West Antarctic Ice Sheet were to melt it would add three meters to average global sea level, affecting every coastline in the world. In short, any changes in the bedrock landscape hosting the ice can in principle have a great impact in the ice evolution. The land uplift that we measure is one of the most important changes occurring to the sea floor below the West Antarctica Ice Sheet. Does the ice sheet need to rise above the ocean to be "safe"? 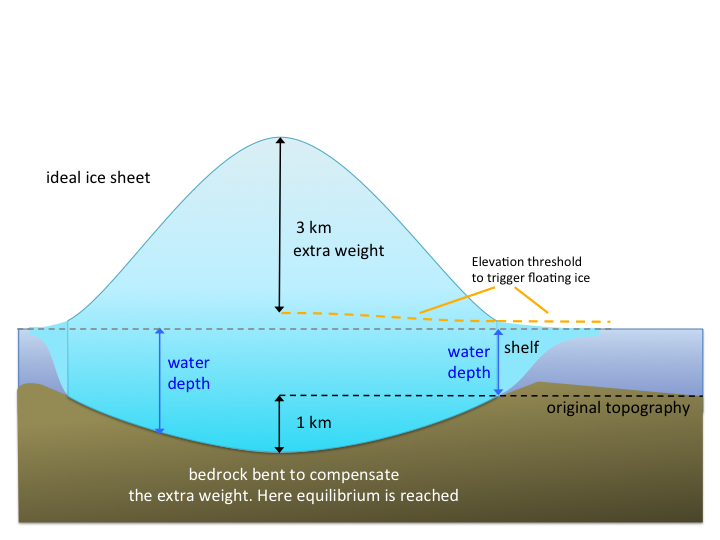 Now, given the depth of the seafloor (up to 2.5 kilometres as mentioned earlier), you might think that a few meters of bedrock rise cannot possibly be enough to push the entire ice sheet out of the ocean! And you would be right. So, how might this uplift help protect the ice sheet against the warming effect of the ocean? The quick answer is that even small changes can be effective, and the bedrock rise creates a slightly better environment for the ice sheet to fight off the effects of ocean warming. We are talking about better chances, not a guaranteed positive outcome. A) The ice is lighter (less dense) than water, so it naturally tends to float when it is immersed in enough water. B) Ice that is already floating does not affect global sea level. The global sea level rise comes only from grounded ice that melts or suddenly starts to float. So we really need to understand the processes that make this grounded ice more or less stable. Why is the ice sheet sitting on the sea floor? You might also wonder why the ice sheet immersed in water is not floating in the first place. This is because the water is not deep enough or, in other words, there is so much ice that the total weight is sufficient to keep it grounded. This process is shown in the animated gif below. The extra weight that keeps the ice sheet grounded to the seafloor, if melted, is what could contribute to global sea level rise. However, an ice sheet has a complicated shape, determined by the shape of the land beneath and, most importantly, by the fact that the ice flows from the inner and thicker part of the ice sheet toward the coast and open sea. All of this is to say that an ice sheet has complicated interior dynamics rather than simply being a big block of ice, as shown in the image below. The stability of the West Antarctic Ice Sheet depends critically on where the ice sheet is floating and where it is grounded. The ideal demarcation between grounded and floating regions is called the grounding line. When the ice sheet thins, the portion of ice closer to the sea loses weight and becomes too light to remain grounded, so it floats. The grounding line will then migrate inland as the ice melts (see the animation below). A reduction of the water depth has the opposite effect on the grounding line, and pushes it out to sea, making the ice sheet more stable, as shown in the animation below. The grounding line is a very important concept to understand the entire process of ice retreat. Ice melting, ocean eroding ice, ice thinning, or any ice reduction, all have one remarkable effect: pushing the grounding line inland. This is called "ice retreat" or "grounding line retreat." So melting ice is just one contender that pushes the grounding line inland, making the ice sheet less stable. Sea floor uplift, local changes in gravity, aliens sucking up ocean water(! ), or an increase of land ice in other parts of the world, all reduce the water depth around the ice sheet. This has another remarkable effect: pushing the grounding line outward. This is called "ice advance" or "grounding line advance." So, water depth reduction is another contender, although I admittedly do not know of any scientific study that has actually documented aliens sucking up ocean water! The faster contender wins the race and decides where the grounding will go: Inland (less stable) or outward (more stable). As we report in our recent study, we now know that the land in this part of Antarctica is rising much more than expected, and that the surrounding ocean is becoming relatively shallower as a result. This is pushing the grounding line outward towards the sea and it could be enough to counteract the grounding line retreat (caused by ice melting) and therefore to favour a stabilising scenario. So far, the majority of computer models that simulate the ice sheet response to climate change have not included the effect of ocean shallowing, because it was considered irrelevant. This is because the reduction of the water depth was thought to be negligible over the timescale of a human life. That has been already proven to be a wrong assumption! In fact, recent studies have quite clearly shown that a fast drop of the local water depth around the ice sheet can indeed provide an effective stabilization factor so long as global temperatures do not rise too much (see here and here). Those same studies identified quite a strict condition for this effect to apply: the Earth structure must be soft enough for the land to rise or in other words the local water depth must fall very quickly. Our study revealed that in this part of West Antarctica, this condition has been abundantly met and surpassed: a much softer (than required) mantle is driving a rapid uplift of bedrock in the area. Here, local water depth is indeed falling far more quickly than expected, thereby stabilising the ice sheet. Ultimately, the stability of the West Antarctic ice sheet will depend on which contender wins out in the race between ice melting and bedrock rise. And this really depends on how warm the planet becomes. The good news is that in the case of the Amundsen glaciers, one contender (bedrock rise) is still in the race and that these favourable conditions could help stabilise the ice sheet. But, it is too soon to tell whether this will be enough to stabilise this important region of Antarctica. In any case, if the global temperature rises too much, whatever positive feedback acts on the ice sheet, it is not going to win the race against ice melt. So reducing our impact on global warming is our best bet. And, while I think of it, investing in Antarctic research is another pretty good bet! After all, more research in this almost alien landscape, will allow us to answer these questions, and more. The hidden landscape underneath the Antarctic ice sheet has a deep influence on how the ice moves and how it has evolved to its present state. So, any new piece of information is crucial to understanding the behaviour of the massive ice sheet that could have implications for us all.